Want to face a sea of crazed rock fans waiting for Motley Crue? Of course you do! And here's your chance: Guitar Center and Motley Crue have partnered for Guitar Center On-Stage, which will provide one up-and-coming band the ultimate, career-altering opportunity - to open on tour for the Crue. 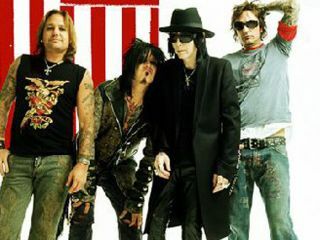 Until September 21 2008, bands across the US can submit their music for a shot at a prize package that includes an opening slot on Motley Crue's 2009 US tour, $25,000 cash, $20,000 in new gear from Gibson Guitar, management from Tenth St. Entertainment and a recording deal from Eleven Seven Music, Motley's management and record label. Fans can vote for their favorite bands between August 4 and September 28. Then a judging panel of industry professionals will review the top bands, selecting 30 acts to advance to regional evaluation events held in mid-October at Guitar Center locations in New York, Los Angeles and Chicago. After narrowing the list to the top six bands at the regional events, Guitar Center will host a final round of evaluation on November 12, 2008 at Guitar Center Hollywood, where each of the six bands will perform live for members of Motley Crue. "Our partnership with Guitar Center gives us the opportunity to help an up-and-coming band by giving them every element needed to succeed," says Crue guitarist Mick Mars. "We're looking for the next generation's great rock band." Click here to enter the contest. Or if you simply want to check out the bands and vote, that's cool too.